Actor Gary Sinise describes his road to the Catholic Church through the influence of his wife. Gary Sinise, the actor known for playing Lieutenant Dan in the 1994 movie "Forrest Gump," discusses journey to becoming a Catholic in his new book; "Grateful American". He is also the founder of an organization, Gary Sinise Foundation's (www.garysinisefoundation.org),that helps thousands of war veterans. "At one point, she went to a Catholic church looking for an AA meeting. This little French woman, she asked her, 'Where's the AA meeting?' She looked at her (Moira) and said, 'You should become a Catholic,'" he added. "Something happened to her at that moment — I don't know, something that had been aligned within her. Her mother was Catholic, but she fell away from the church and married a Methodist. She was not raised in any particular faith." "I laughed and said, 'Wait a minute. We just moved across the street from a public school.' 'Yes, and I'm going to send our kids to a Catholic school,'" he added. "Sure enough, when we go home she went to the RCIA program at our local Catholic church." For the next year, his wife was in the Rite of Christian Initiation of Adults program. "We started going to Mass," Sinise said. "My wife was confirmed in Easter 2000. ... The following year that little church became a sanctuary, a place of great comfort" following the 9/11 terror attacks in 2001. "I surprised my family. I'd gone through the confirmation classes and whatnot myself behind everybody's back and I didn't tell anybody that I was doing it," he said. "On Christmas Eve 2010 I told the family I was taking them to dinner at Morton's Steakhouse and have Christmas Eve dinner," he said. "And on the way there, I pulled into the church, and everybody asked, 'What are we doing here?' I said come on in. We walked into the church. The priest was there, and he confirmed me. It was beautiful." Sinise tells this faith story his newly published book, "Grateful American." In the memoir, he details his life growing up in the Chicago suburbs, as well as his many adventures in films and on stage. 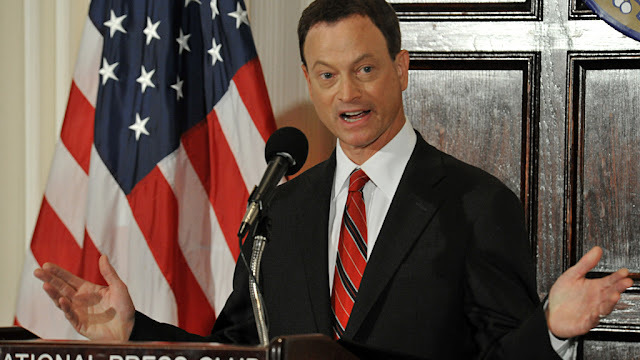 The Gary Sinise Foundation's website, www.garysinisefoundation.org, includes a page listing his appearances and visits at military bases and hospitals .